SONIC serves as an advocate for teachers in local communities through its Limeades for Learning program. Each year, teachers spend more than $1 billion of their own money on school supplies. From books to technology to maps and music, teachers bring learning to live every day. Since 2009, SONIC has served as an advocate for teachers in local communities through its Limeades for Learning program, a national initiative to provide teachers with essential funds to continue inspiring creativity and learning in public school classrooms across the country. 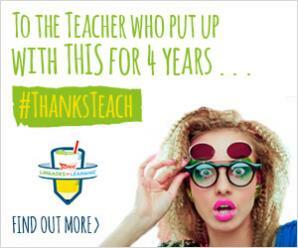 In honor of SONIC’s $1 million donation to local public school teachers through Limeades for Learning, we’re launching a hashtag campaign to thank teachers for their personal commitment to their classrooms. #ThanksTeach. We asked our bloggers to share the thoughts on the #ThanksTeach mission and on an adorable video of real children sharing theirs. The Thank You Teach Sweepstakes on BlogHer runs from 5/3/16 through 5/31/116 and is only open to individuals who, at the time of entry deadline, are legal residents of the United States and are 18 years or older. Click "here" to read the official rules. Winners will be randomly selected from all eligible entries. Good luck!